Luxury bungalow with fully finished walkout lower level within a quiet pocket of estate country homes. 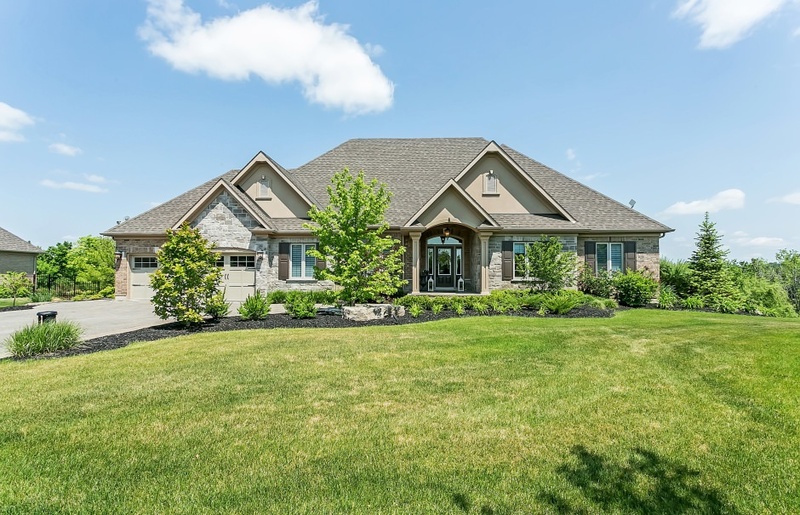 This home is situated on a scenic 1.5 acre lot, overlooking idyllic countryside. A tasteful stone and stucco exterior dressed with professional landscaping opens to an airy foyer with vintage 7” hand-scraped oak flooring, deep baseboards, and elegant lighting fixtures. Numerous upgrades throughout the home include interior doors with 12” transoms and upgraded hardware, closets with automatic interior lighting, upgraded plumbing fixtures, Silhouette blinds and California shutters, and more. A formal dining room with tray ceiling, double height crown moulding and central chandelier, and a den/bedroom with double access from the rear hallway flank the foyer. The open concept great room features a gas fireplace with full height stone surround and Barzotti mantle, vaulted ceiling with central chandelier, and sweeping views of the countryside. The gourmet eat-in kitchen boasts custom French style cabinetry, upgraded antique granite countertops, stone subway tile backsplash, high-end stainless steel appliances, and a walk-in pantry. A two-tiered central island with pendent lighting and bar seating overlooks the sunny breakfast area. Two double French doors open to a covered deck, and an additional open-air deck, overlooking the rear yard – perfect for entertaining or simply enjoying indoor/outdoor living. A spacious, highly functional mud and laundry room provides inside access to the finished double car garage. On the opposite side of the home, double doors open to the master bedroom with tray ceiling, double height crown moulding, central chandelier, and a walk-in closet with built-in storage. The spa-like five-piece ensuite offers Crema Marfil honed marble tile flooring with a mosaic inlay, His & Hers vanities with Caesarstone countertops, seamless glass shower with rain showerhead, and a separate soaker tub. A third bedroom and main three-piece bathroom complete the main level of the home. The fully finished walkout lower level provides two additional bedrooms, and an additional three-piece bathroom. The focal point of the recreation room is the gas fireplace with high-gloss stone tile surround flanked by two above-grade double casement windows, allowing for plenty of natural light. 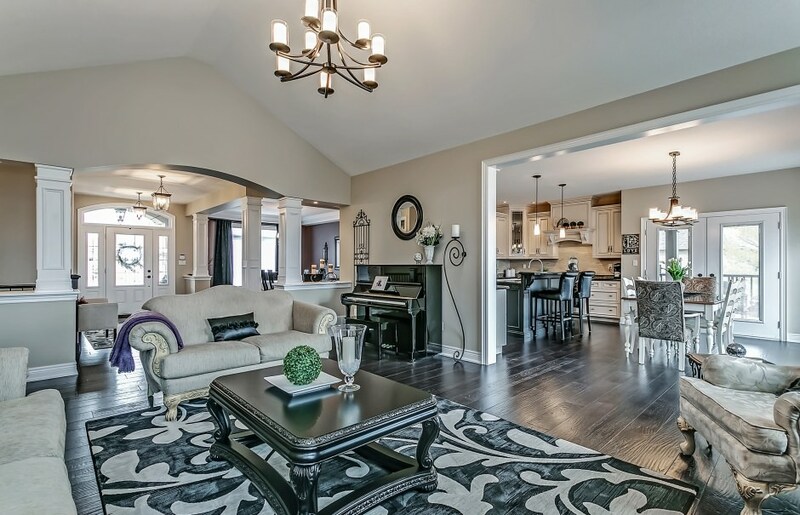 Double French doors open to an oversized games room, and exercise room with rubberized flooring. The lower level walks out to a stone patio and additional seating area with a fire pit. The peaceful rear yard is your private oasis, overlooking a luscious lawn, sprawling fields and forest, as well as a pond and traditional bank barn. Experience the best that country living has to offer, with minimal maintenance and a quick commute to HWY 401 and amenities.